"But she doesn't look like you. We have lots of other dolls that look more like you." In a society where racism and social prejudice is becoming increasingly intolerable, it’s hard to digest that there still are adults who impose their narrow-minded biases on innocent kids. This two-year-old, however, shot down one such adult in classic fashion. Sophia, a little blonde-haired cutie from South Carolina, celebrating one month out of the nappies and her mother, Brandi Benner, decided to treat her to a gift at their local Target. 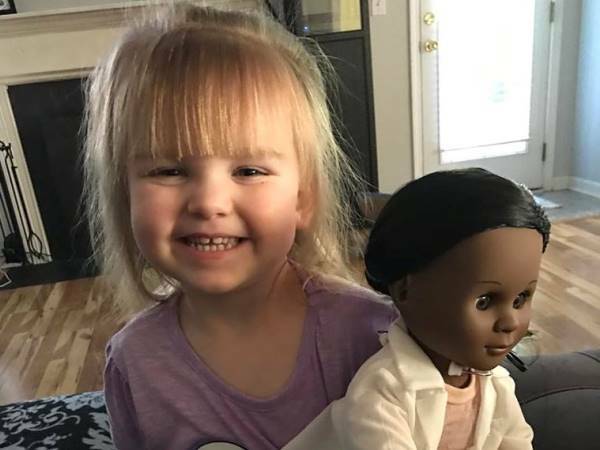 In a post on Facebook, Brandi explained that her daughter, who dreams of being a doctor one day, chose a ‘doctor doll’. It goes without saying that Sophia was excited to have a well-deserved new toy, so much so, that even a snarky remark from a cashier couldn’t put a damper on the little girl’s joy. "Are you sure this is the doll you want, honey?" the cashier asked. "Yes, she does. She's a doctor like I'm a doctor. And I'm a pretty girl and she's a pretty girl. See her pretty hair? And see her stethoscope?" Brandi’s Facebook post gathered more than 454 000 ‘likes’ and was shared by more than 184 000 people. “When a child is born they have no concept of the tone of the skin they are living in. Thank you for teaching Sophia what's important in life like love and saving lives,” one user commented.